A season and two eras came to an end on Friday for the Franklin Quakers. Franklin's softball team lost 5-2 at Oregon City in the Class 6A quarterfinals. The Quakers finished the year with a record of 23-7. Seven Franklin seniors, all starters on the 2018 Portland Interscholastic League championship team, played their final high school game. Over the past four years, Franklin won 80 games, a total rarely seen from a PIL program. Friday also was the last time Franklin will be coached by Gina Aman, who is stepping down after 18 seasons with the Quakers, the past 16 as head coach. "This group of kids is amazing, and it's been a pleasure to coach them," Aman said, fighting back tears after an emotional final postgame chat with her players. "It's a special group. You don't get a group like this very often." The Quakers had won 12 games in a row, and 21 of their last 22, but on Friday they ran into a buzzsaw NCAA Division I-caliber pitcher in Oregon City senior Morgan Hornback. The fireballing Pioneer, who is headed to Texas Tech for softball and to study law, struck out 12 batters without a walk and had the Quakers on their heels most of the afternoon. Franklin's offense came to life late in the game, though, and the Quakers got three of their five hits in the top of the seventh inning, when they scored both of their runs. "Morgan's a great pitcher, and my kids came around a little too late," Aman said. "You can't do it in the seventh inning, you've got to do it early on, and had we made the adjustments earlier, I think it's a different score." Hornback fanned six of the first seven Franklin batters. "The game plan was to come out and just hit my spots," Hornback said. "Work the corners, go high-low, and keep them off balance. And if they hit it, let my defense handle it." The Quakers' first hit came with two out in the fifth, when PIL Player of the Year Emma Foster ripped a double to left field. A ground out to second ended the threat. In the sixth, also with two out, Franklin's Yarely Guerrero-Valenzuela singled into the hole on the left side. But a strikeout kept the Quakers from getting anything going. Foster led off the seventh with another double, hitting the ball even harder, this time to left-center. "Emma's on fire," Aman said. "She's a big-time player, and she's going to do good things in college (at the College of the Siskyous)." A chopper into the hole by Grace Elliott put runners on first and second. With two out, Guerrero-Valenzuela doubled home two runs with a shot to left. By then, Franklin was shortening its swings and making better contact. "She (Hornback) supplies the power, so you've just got to shorten it up and go with it … make her come to our zone and be more disciplined," Aman said. "Early on, we were trying to overpower her rise ball, and we were unsuccessful with that. "But take nothing away from them — they're a great ball team and they hit the ball well, played great defense, capitalized on a couple of our errors early on, and we just weren't able to come back from that." Oregon City scored one run in the first inning, one in the fourth, two in the fifth and one in the sixth (when the Pioneers had the bases loaded and no one out). "We came out hitting today," Hornback said, after an 11-hit day by the Pioneers. The top of the order was strong for OC. Leadoff hitter Allie Edwards and No. 2 batter Isabelle Lewis each went 2 fof 4, and in the No. 3 spot Zoie Iverson was 3 for 3 with a triple, sacrifice fly and three RBIs. Franklin had lost to Oregon City 6-1 in its second game this season, but the Quakers beat the Pios, 4-3, in 2017. That year, Franklin was the PIL champion. The 2017 Quakers lost in the first round of the 6A tournament, but finished 20-7. In 2016, Franklin won the league title and went 24-5, reaching the quarterfinals as well. In 2015, the Quakers were third in the PIL and 13-14 overall, losing in the first round. This year, Franklin again played at a high level, led by the seniors. "It's been a fastastic season," Aman said. "These girls, their goal was to get back to the quarters, and we did. It would have been nice to get to the semis, but at the start of the season, we wanted to get here, and they accomplished that. "Over four years, they've put in a lot of hard work, a lot of time and a lot of heart. "They feed off each other, they picked each other up on and off the field. All around, they're just a great group of kids who love to be in the presence of one another, and all work for one common goal. There's a lot of camaraderie." Aman said she will still be "a face in the program, I just won't be the one in charge." 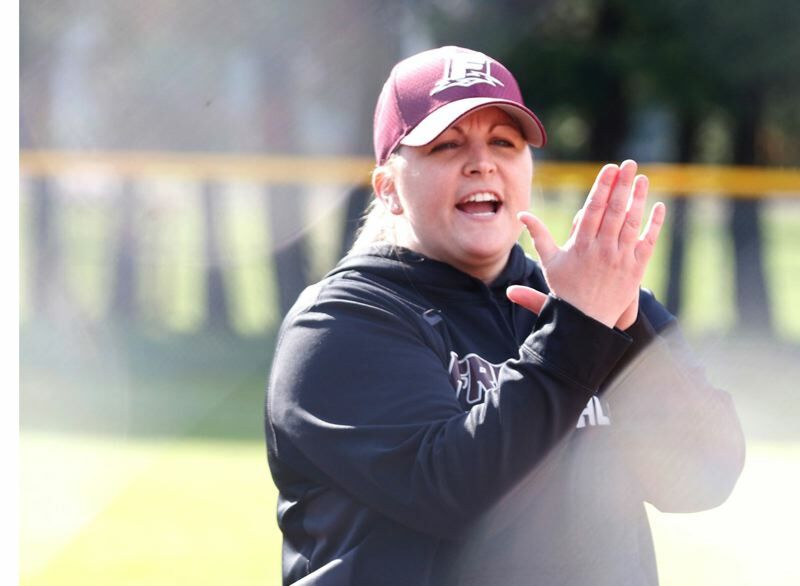 She'll continue to work in the PIL athletics district office, but she has decided it's "time for somebody else to take the program over." A Franklin graduate, Aman said she became a coach at her alma mater to give back "to the program I got so much out of, that got me to play college ball. And I love to coach, love to teach kids." She has an 11-year-old son and 9-year-old daughter (who just began playing softball). "I'm also coaching Little League, and I need to be there for them," she said. "They're both super active in athletics, and my daughter does piano." The kids are in the Franklin district. "It's time for me to be a mom," Aman said, "and just be there to support and mentor and guide and help at Franklin in whatever way I can, because there are more good things coming. Franklin is going to be all right, even with losing seven seniors. We've got young kids coming up in two or three years, so we're going to rebuild." • No. 1-ranked Tualatin eliminated No. 8 Jesuit with a 4-2 home victory in the quarterfinal battle of Metro League teams. Tualatin will play host to Oregon City in one of Tuesday's 6A semifinals. The Pioneers are 24-5, after finishing third in the Mt. Hood Conference behind Clackamas and Barlow, which lost to 13th-ranked Franklin 7-2 in Wednesday's second round of the Oregon School Activities Association playoffs. "We're coming out strong and letting everybody know we're here," Hornback said of the fifth-ranked Pioneers. "We're not a team to be slept on. This is definitely the best team I've played on in four years here, the strongest team all the way around, no question about it." The other semi will have North Medford at Clackamas at 4:30 p.m. Tuesday. The No. 2 Cavaliers won Friday 6-2 at home over No. 7 Grants Pass, while No. 3 North Medford turned away visiting No. 11 Tigard, 9-2.